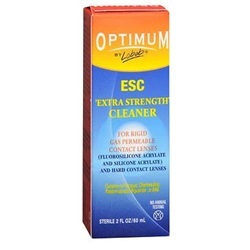 Optimum Extra Strength Contact Lens Solution, 2 oz. Sterile Optimum Extra Strength contact lens solution in 2 oz. bottle. For use with fluorosilicone acrylate and silicone acrylate rigid gas permeable (RGP) and all hard contact lenses of any polymeric structure. Contains no polymeric solvents. Manufactured by Lobob. Comes as singles.